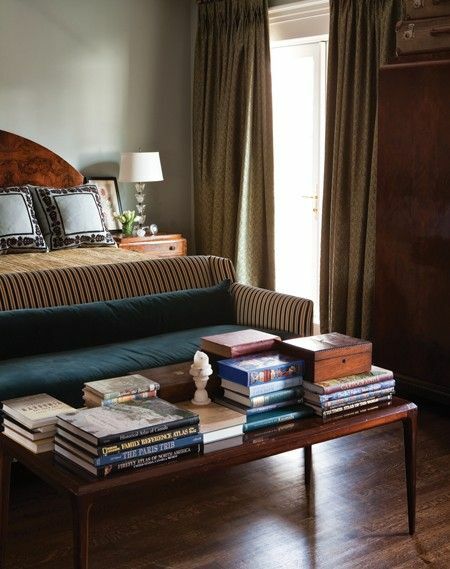 The bench at the foot of the bed – it’s a staple in bedroom design, particularly in master bedrooms. It’s the perfect spot to put on your shoes, decorative bedcovers can be folded down onto the bench, it helps to fill the space in larger rooms. I’ve even been known to add a bench in rooms designed by Beautiful Habitat. Lately I’m seeing the bench replaced by sofas, settees and chairs – furniture pieces with backs. And then I started to see sofas morph into full seating areas such a this room below. What do you think of this trend? Love it – it’s an out of the box use of the space; it creates more function; it uses the space better? Or leave it – it closes off the room too much; it distracts from the bed; I’m not holding board meetings in my bedroom? What are your thoughts of sofas (or other furniture with backs) and seating areas at the foot of the bed?